The memorial will be part of a new four-acre Eisenhower Square located along Maryland Avenue in Southwest Washington. Controversy over a proposed final design created by architect Frank Gehry and public opposition from the Eisenhower family put the brakes on the process last year. A bill introduced by Rep. Rob Bishop, R-Utah, before the Committee on Natural Resources would block funding of the Gehry plan and send the Eisenhower Memorial back to the drawing board. "President Eisenhower's service to our country deserves to be honored with an appropriate and fitting memorial that more adequately reflects his legacy. In light of this, I will continue to pursue the passage of this legislation,"said Bishop. The Gehry design surrounds the newly created Eisenhower Square with 80-foot metal mesh woven tapestries. 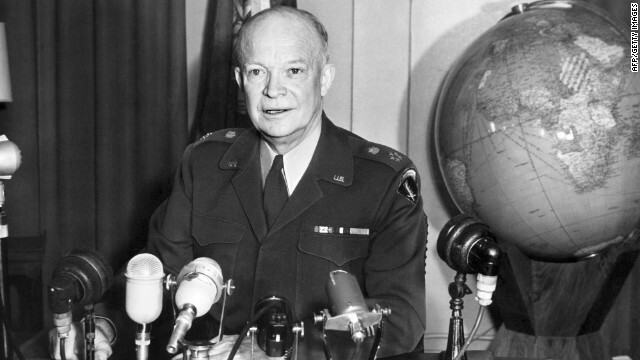 The Eisenhower family has questioned the symbolism of a memorial dedicated to the Cold War president with art that resembles an "Iron Curtain." "Though creative, the scope and scale of the Gehry design is too extravagant and it attempts to do too much. On the one hand, it presumes a great deal of prior knowledge of history on the part of the average viewer. On the other, it tries to tell multiple stories. In my opinion, that is best left to museums," Susan Eisenhower, the former president's granddaughter, said. Gehry redesigned part of the memorial last year after the Eisenhower family opposed a central statue depicting "Ike" as a "barefoot boy from Kansas." Frank Gehry did not attend the hearing. The Eisenhower family has voiced frustration over transparency of the design selection process and supports an open architectural competition. "Continuation of the status quo will doom the prospect of building a memorial. Your are right that no consensus on the memorial design has emerged and that it is time to go back to the drawing board, with an open process for the redesign of the memorial," Susan Eisenhower said. The durability and cost effectiveness of the current plan is also now being questioned by members of Congress. "This was a decision made without cost being concerned sufficiently. But also let's question what's there. If every inch of the Mall is critical, then every inch of this memorial must be dedicated to the message and that message must be one consistent with the mandate of Congress for recognizing the contributions of President and General Dwight David Eisenhower," Rep Darrell Issa, R-California, told the subcommittee. Selecting an alternative design does not necessarily mean "junking" the entire Gehry plan, said Rep Rush Holt, D-New Jersey. "The only thing worse than art designed by a committee is art designed by a congressional committee," Holt said. A memorial that has cost 60 million in planning and Americans are jobless, homeless and hungry. He should be honored however I would think that he, aso a great American would be more concerned with they state of the nation and having a "memorial" that was living like and affordable housing complex, a work training program or even a homless shelter. The country is b.r.o.k.e. And, yes I Like Ike! A great military leader and president–but, can we really afford this folly? Sixty-million dollars and they are going "back to the drawing board" ? visit and contemplate his contributions. Put a magnificant statue of the President in the center, and be done with it. Like his granddaughter said: Let the stories "be told by museums". If Issa or the family aren't happy with it, let them pay for it. $60 million dollars (and I'm assuming that much if not most of this money is tax dollars) and 13 years and no final design yet? It sort of sounds like a boondoggle at this point. Who provided the specifications to the designer and who is responsible for the oversite of this process? A great General , A great president . n his farewell address, President Dwight D. Eisenhower warned the American public of the dangers of the military-industrial complex. Ten years ago to today we invaded Iraq . I don't think , the NEOCONS listened to that speech .